Delicious Seeds is a very well known cannabis brand which is coming from Spain. This brand has developed a number of very potential cannabis seeds, whereby they are playing a big part in the cannabis seeds world at the moment. They produce feminized and autoflower seeds, both of very good quality. 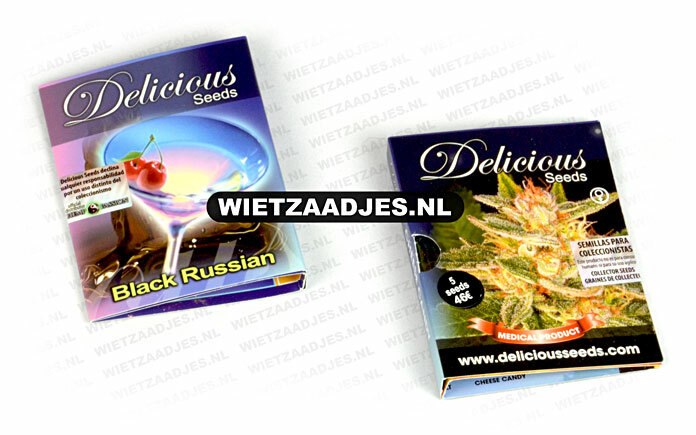 Delicious Seeds makes cannabis seeds which are suitable for an indoor and an outdoor grow. Auto Dark Purple from Delicious Seeds are autoflower cannabis seeds with mainly Indica genetics. This strain gives a narcotic effect what makes her extremely suitable for medicinal purposes. Black Russian from Delicious Seeds is very powerful cannabis, which is not suitable for the starting smokers. This cannabis plant is originated by crossing very strong strains, from this came cannabis with a high content of THC. Candy Auto from Delicious Seeds is a beautiful autoflower strain which is originated from a crossing between two tasteful strains. This mainly Indica cannabis plant tastes sweet and slightly spicy. Caramelo from Delicious Seeds is a cannabis strain with a very high THC content. This powerful cannabis won a number of nice prizes. This strain is of very good quality and has a lavender-like flavor. Caramelo F1 Rapid from Delicious Seeds are autoflower cannabis seeds. This Sativa dominant cannabis strain grows very fast and the effect of smoking this weed is a strong euphoric high. This cannabis strain delivers in 8 weeks a high yield of cannabis! CBD Jam van Delicious Seeds zijn feminised wietzaadjes die binnen en buiten te kweken zijn. Ze heeft een hoog CBD gehalte en het effect is mild. Cotton Candy from Delicious Seeds is a cannabis with a prize on her name! These beautiful cannabis plants are suitable for the starting growers. This weed gives you a happy and a cheerful feeling. Critical Kali Mist from Delicious Seeds is a cannabis strain with a very high content of THC. Using this cannabis is not recommended for the starting smokers. The mainly Sativa plant has a delicious spicy Sativa flavor. .
Critical Neville Haze from Delicious Seeds is a delicious Haze strain which is suitable for an indoor and an outdoor grow. She gives you a powerful effect and is asking for some experience of the grower. In an outdoor grow she does not like to have a humid summer. Critical Neville Haze Auto from Delicious Seeds is an autoflower Haze cannabis strain that contains mainly Sativa genetics. You could grow this autoflower cannabis plant indoor and outdoor. She produces cannabis with a high content of THC. Critical Sensi Star from Delicious Seeds is an almost pure Indica cannabis plant with a very strong and powerful effect. This strain flowers very short and is easy to harvest because she does not produce a lot of leaves. Critical Super Silver Haze from Delicious Seeds is a delicious Haze that will be loved at the Haze lovers. You can feel the effect mainly in the head and she has a strong spicy Haze flavor. Deep Mandarine van Delicious Seeds zijn feminised wietzaden die een hoge opbrengst opleveren. Deze wiet heeft een hoog CBD gehalte en een laag THC gehalte. Deze milde wiet heeft een medicinale werking. Desconocida Kush van Delicious Seeds zijn feminised wietzaadjes die ook als medicinale cannabis gekweekt worden. Ze heeft een hoog THC gehalte en haar effect is krachtig. Fruity Chronic Juice from Delicious Seeds is a cannabis strain with almost pure Indica genetics. This nice and powerful weedplant become a bit larger than the average pure Indica strains. She has a delicious flavor and smell when you are smoking this cannabis. Golosa van Delicious Seeds omschrijving. Honey Bells van Delicious Seeds is een feminised wietzaden soort die een hoog CBD gehalte heeft met een mild effect na het roken. Deze wietplant is gemakkelijk te kweken en geschikt voor binnen en buiten. il Diavolo from Delicious Seeds is a very nice autoflower strain which is originated from a beautiful crossing. This easy to grow cannabis strain is suitable for an indoor and an outdoor grow. She has a pretty high CBD content. Jagg Kush van Delicious Seeds zijn feminised wietzaadjes die sativa dominant zijn. Deze wietplant is bestendig tegen schimmels en rot en geeft een hoge opbrengst. Deze wiet heeft een hoog THC gehalte en voornamelijk een effect in je hoofd. La Bella Afrodita autoflower from Delicious Seeds is a cannabis strain which is originated from a very nice crossing with a extremely well-known strain. This weedplant is suitable for indoor and outdoor grows and she can handle the colder climates better than the average cannabis plants. La Diva from Delicious Seeds is an autoflower cannabis strain which is suitable for the starting growers. She can handle the warm and cold climates and has a delicious flavor and taste when you are smoking this cannabis. La Frutta Di Venus from Delicious Seeds is an autoflower strain with a high THC content. This weedplant grows into a compact bush with many branches. Her effect is powerful and works relaxing. La Musa from Delicious Seeds is an autoflower cannabis plant that grows fast. She is very easy to grow and hereby suitable for the starting growers. This cannabis strain can be grown indoor and outdoor. Marmalate from Delicious Seeds is a cannabis strain which is very easy to grow. This Indica dominant weedplant won a prize and due this prize, it guarantees the quality. Northern Light Blue from Delicious Seeds is a pure Indica strain which is originated from a very well-known crossing. These cannabis plants are very suitable for a SOG or SCROG grow. Using this cannabis gives you a relaxed feeling. Northern Light Blue Auto from Delicious Seeds is a very beautiful autoflower cannabis strain. She becomes a bit larger than the average plants and has a vvery powerful medicinal effect with chronic pain. Original Juan Herer van Delicious Seeds zijn feminised wietzaadjes die je binnen en buiten kunt kweken. Deze wietplant bevat voornamelijk sativa genetica en het effect is vooral geestelijk voelbaar. Sugar Black Rose from Delicious Seeds is a cannabis strain with mainly Indica genetics. This weedplant won a number of prizes and is of good quality. This bushy plant is suitable for indoor and outdoor grows. Sugar Black Rose from Delicious Seeds are autoflower cannabis seeds that deliver a large yield of cannabis. This delicious cannabis strain has mainly Indica genetics and is suitable for medicinal use. This cannabis strain gives you a very relaxed feeling. Het merk Delicious Seeds is een zeer bekend en populair merk, ze bieden zeer goede kwaliteit feminised en autoflower wietzaden aan. Ze leveren deze wietzaadjes in verpakkingen van 3, 5 en 10 zaden. Deze zaden kun je bij ons ook per stuk kopen, we verpakken deze zaden dan handmatig in vochtvrije 'microfuge tubes' met duidelijke labels. De verpakking van Delicious Seeds kan verschillen wanneer je kiest voor een ander aantal of andere soort dan dat op de afbeelding staat. Delicious Seeds biedt op dit moment de volgende feminised soorten: Black russian, Caramelo, Cheese Candy, Cotton Candy, Critical jack herer, Critical kali mist, Critical neville haze, Critical sensi star, Critical super silver haze, Critical yumbolt, Fruity chronic juice, Marmalate, Northern light blue en de Sugar black rose. Van de autoflowering soorten biedt dit merk de soorten: Cheese candy auto, Critical x jack herer auto, Il diavolo autoflowering, La bella afrodita autoflower, La Diva auto, La fruta di venus autoflowering, La musa auto, Northern Light Blue Auto.